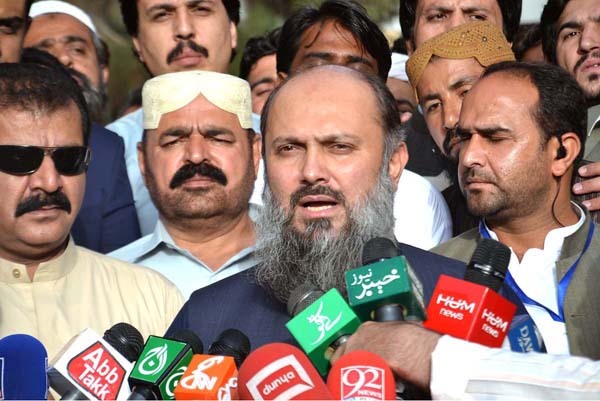 QUETTA, Aug 19 (APP):Balochistan Chief Minister Jam Kamal Khan Sunday said his government would take steps in the ambit of Constitution to bring the disgruntled Baloch people into the national mainstream. Some angry Baloch had already joined the national mainstream in the past due to efforts of official departments, security forces and the provincial government, and he would also try to mainstream the rest in the larger national interest, he added. Talking to media persons after taking oath of his office, he said a comprehensive plan could be evolved to recover the missing persons according to law. Jam kamal said it was the prime responsibility of government to protect the lives and property of the people and for that purpose the departments related to security, including police, Levies Force and others, would be restructured. He said the provincial government would utilize all available resources to provide basic facilities of health, education and clean drinking water, besides ensuring good governance in the province.